Great Mitton is a small village, little more than a hamlet, at a crossing of the River Ribble just south-west of Clitheroe, where the Ribble is joined by the Hodder. Given that there is not much to the village itself, it may come as a surprise that the parish church of All Hallows is such a gem; it probably deserves recognition as one of the finest parish churches in the north of England. 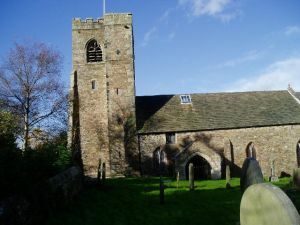 The first historical record of a church at Mitton comes from 1103 when a man with the name of Ralph the Red was the rector. Ralph's church was probably made of timber, for the earliest remains of a stone church we can find here come from around 1270. The imposing and stylish tower was added before 1438, but the real treasure at Great Mitton is the interior of the church. One of the most notable features of All Hallows - aside from the notable slope of the nave from west to east - is the 15th-century chancel screen, which may have been brought here from nearby Sawley Abbey after the abbey was dissolved by Henry VIII. Aside from the screen, which was installed in 1593, much of the impressive interior is due to the efforts of the Shireburne family of nearby Stonyhurst. Memorials to generations of Shireburnes stand within the Shereburne chapel (yes, the spelling is different, though modern writers often 'normalise' odd historic variant versions). A hagioscope, or leper squint, is let into the outer wall, allowing a view of the high altar from a safe distance - far from the congregation. In the churchyard stands a 14th-century cross-head, carved with a depiction of Mary and St John. Another cross-base, possibly of Saxon date, stands at the B6243 road junction at Mitton Green.